Rapadura sugar is an unrefined cane sugar that preserves the natural caramel taste of the sugar. It has a fine-grained texture and can be used in place of white sugar. However, unlike white sugar, it has a grainy texture rather than a crystallized one because it is not as heavily processed. Rapadura sugar is slightly richer in some nutrients than white sugar is, although it should still be consumed in moderation. According to Bulk Natural Foods, rapadura sugar is less processed than other sugars, including ones that contain more molasses. Molasses is what gives brown-colored sugars, including rapadura, their rich taste and dark color. Rapadura sugar is higher than other sugars in several essential minerals, including potassium, magnesium, calcium and phosphorus. Bulk Natural Foods states that it is also higher in vitamin A as well as vitamins B-1, B-2, B-6 and niacin. However, these amounts are minimal, so a 1-teaspoon serving of rapadura sugar is not a rich source of most essential vitamins and minerals. While the small serving size of rapadura means it contains few essential nutrients, it is rich in iron. A 1-teaspoon serving of rapadura has 11 percent of the daily value of iron if you are on a 2,000-calorie-per-day diet. In comparison, white granulated sugar has no iron per 1-teaspoon serving. Iron is considered an essential mineral because your body uses it to produce myoglobin and hemoglobin, two proteins that carry oxygen throughout your body. Hemoglobin is also needed to make red blood cells. The recommended dietary allowance of iron is 8 milligrams for all men and for women over the age of 50, and 18 milligrams for women who are 50 or younger. Regardless of its richer nutritional content, rapadura sugar should still be consumed in moderation because it is an added sugar. Added sugars are considered primary contributors to weight gain and obesity. The recommended upper intake of added sugars -- including "natural" sugars such as rapadura or honey -- is 100 to 150 calories per day. This is roughly 6 to 9 teaspoons of added sugar daily and includes sugar added to commercially prepared foods. While rapadura sugar's brown color and slight caramel flavor might make it not a good choice for, say, shortbread cookies that need a clean, white color, it works well for numerous other foods. Using rapadura for darker-colored baked goods can lend extra richness to the food, or you can use rapadura to sweeten and season savory dishes, such as stews and marinades. 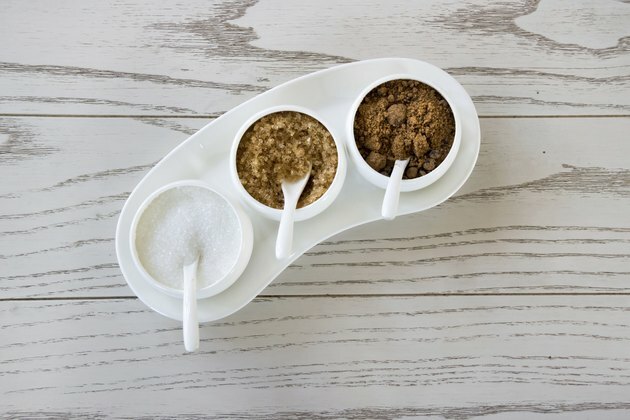 Rapadura sugar can be substituted for white on a 1:1 ratio -- 1 cup of rapadura for every cup of white sugar.